London to Sydney marathon rally show – 50 years on! Home » London to Sydney marathon rally show – 50 years on! We are big fans of epic road trips. You might have realised this following our recent sponsorship of Pup2Pub Expeditions – which encompassed a 27,000-mile journey of a TVR Chimaera from the northern most pub in the world to the southernmost. What an adventure! Talking of adventures, let’s roll back 50 years to 1968. A plan is being hatched for an epic endurance rally from London to Sydney. A rally that was set to become one of the most famous endurance rally’s in history and would pave the way for a series of new events. This was back in the day when political situations did not prohibit passage through certain countries and drivers were responsible for vehicle maintenance during the race. Not only would it be a test of drivers but vehicles too in the searing heat and dust. Departing from London on the 24 November 1968, drivers had to speed across Europe and Asia making their way towards Australia, covering 10,000 miles in the wake. After a stop off in Bombay, there was a 9-day sea crossing to Australia. Once in Perth, Australia, the rally re-started on the 14 December with a 3,000-mile trek through the outback. Finishing in Sydney, on the 31 December. Can you imagine the stories…in fact, the stories were so good, they have filled several books! The event was won by Andrew Cowan in a 1968 Hillman Hunter, with Paddy Hopkirk in the Austin 1800 finishing 2nd, and the Ford XT Falcon GT of Australian Ian Vaughan finishing 3rd. The rally was certainly a great triumph for the Rootes group! In an interview with MotorSport Magazine, Andrew Cowan recalled how the Rootes board gave him £25,000 to get the Hunter up to rally condition. Cowan said “We tested it to destruction. We drove it and drove it, on the rough at Bagshot, through water, through mud and sand, we did everything we could to break everything that could possibly break. And each time anything broke we didn’t just replace it, we made it stronger. That would then put more strain on something else, and as each part broke we redesigned it”. Good old-fashioned motorsport, without all the computers! Back with us in the present day, to celebrate the golden jubilee of the 1968 London to Sydney Marathon Rally, the Historic Marathon Rally Group is staging a commemorative event on Sunday 29th July 2018. This special celebration event will be a non-competitive run from Wroxton to Gaydon Motor Museum and will include a display of cavalcades around Gaydon during the day along with several other attractions. 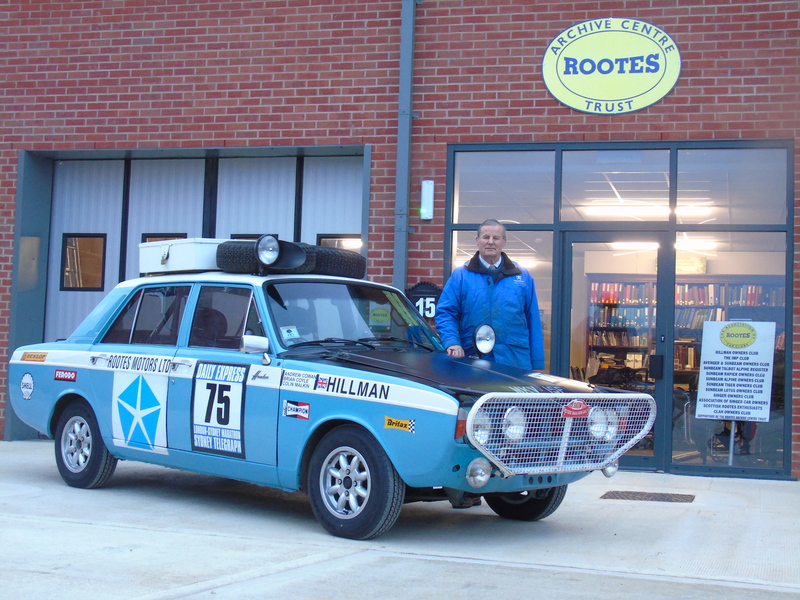 As a Rootes enthusiast and RAC rally car driver, the late Gordon Jarvis was well known for this London-Sydney Hillman Rally Replica. With a 1725cc engine fitted with Weber twin 40’s, Gordon built the car to be a correct replica copied from Andrew Cowan’s original rally car – it was even approved by him! Gordon was also lucky enough to get a similar registration number for his rally replica which made it a good body double for the original at events. Gordon’s rally replica completed a couple of regularity rallies in the Alps and by his own admission was a fun car to build and was fun collating all the parts. As a founder Trustee of the Rootes Archive Heritage Trust, Gordon was instrumental in making the Trust a success. To mark the golden jubilee of the first London to Sydney Rally fellow colleagues, James Spencer and Andy Bye, will be joining this commemorative event in Gordon Jarvis’ Hunter Rally Replica. We are delighted to be supporting James and Andrew as their insurance provider. ClassicLine are proud of their close relationship with the Association of Rootes Car Clubs and are also champions of the Rootes Archive Heritage Trust. For every insurance policy taken out with us by an ARCC member club, ClassicLine will give a contribution back to the Rootes Archive Heritage Trust, helping to preserve the history of the Rootes cars for future generations. James, Andy, this is one story we look forward to following and hearing all about your adventures. Hopefully, involving less breakdowns and incidents than the original rally, but with just as much fun!